• Highest precision to 0.2 Lb. • Read out in clear female voice. • Hello - I Am Ready - Weight - Goodbye. Talking function can be turned off. • User-friendly greetings; no programming needed. 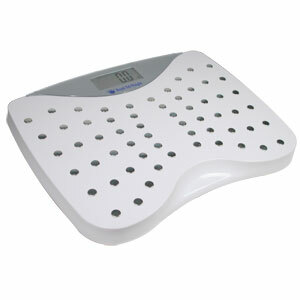 • Step and weigh technology, no need to search for buttons. • Sturdy steel based construction for durability. • Extra-wide 14.5" slip-proof platform for superb stability. • Large-Print quick start manual included. • Convertible to metric system. • Weighing capacity: 330 Lbs. • Extra large 1.5" LCD display. • Uses 4 "AA" batteries (included). • Also available in: German (Kg), French (Kg), and English/Spanish (Lb/Kg).